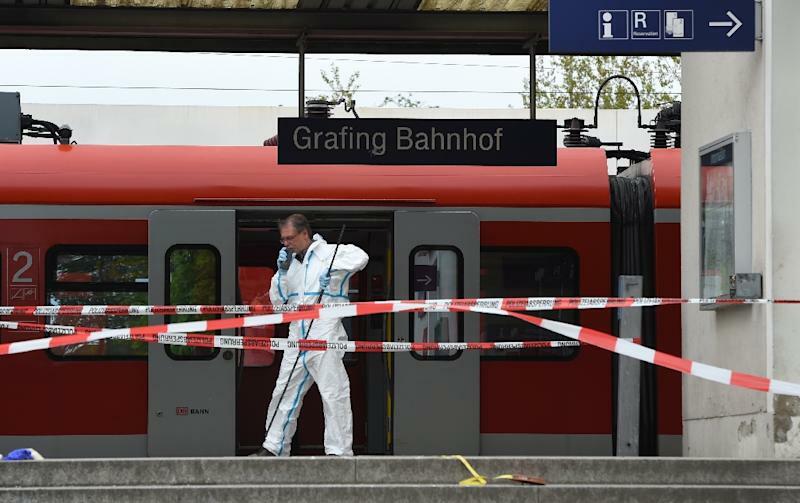 Grafing (Germany) (AFP) - A mentally disturbed German man carrying a survival knife Tuesday stabbed to death one person and slashed three others in a bloody dawn attack at a railway station. 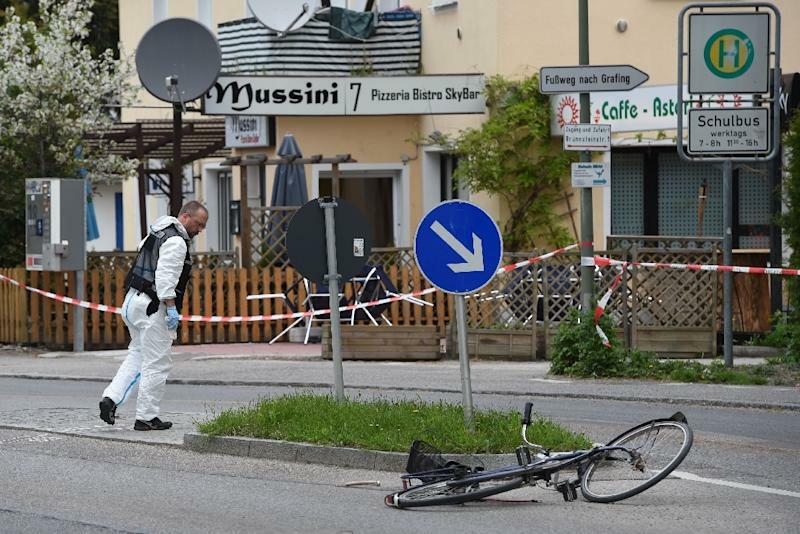 The assault initially sparked fears of a jihadist attack because the 27-year-old had yelled "Allahu akbar" (God is greatest) and threatened to kill "non-believers". However, police said the man -- named locally as Paul H. -- appeared incoherent and may be sent to a psychiatric hospital, while stressing he had no known links to Islamist militant groups. "He's a crazed psychopath," one police investigator told AFP, speaking on condition of anonymity. 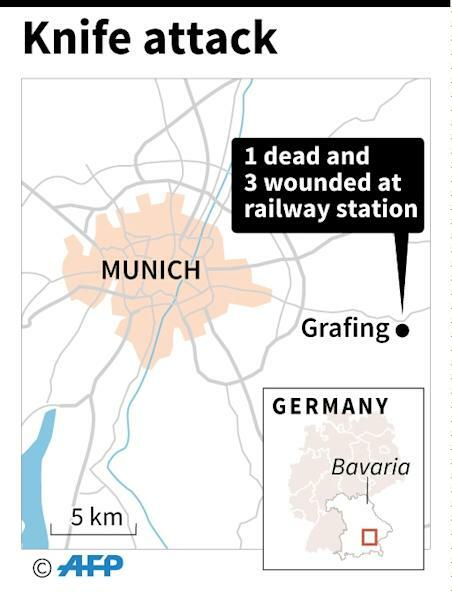 The man, who had spent the night outside Munich railway station, launched his apparently random knifing spree around 5:00 am (0300 GMT) in the small town of Grafing, 30 kilometres (20 miles) east of the Bavarian state capital. One victim, a 56-year-old man, died of his injuries in hospital. A 58-year-old man was badly injured, while two other men aged 43 and 55 suffered non-life threatening injuries. "We have no information to suggest he was part of an Islamist network," she told a press conference, adding that he was also not known to domestic security agencies. The detainee "appeared to be in a rather confused mental state," added a police spokesman, saying the suspect had briefly been in psychiatric care the previous day after coming to the attention of police in central Hesse state. "The fact that he yelled 'Allahu akbar' was reported by a witness and by the assailant himself... and the phrase... 'you non-believers, you must die' was also heard by a witness," he said. "We are an absolutely peaceful Bavarian small town in the greater Munich region," she said on NTV. "Something like this is absolutely new and has deeply shocked the people here who only know things like that from television. "That something like that happened here is absolutely unbelievable." The violence came at a time of heightened public fears about jihadist attacks. Last August, the Islamic State group threatened Germany with attacks in an online execution video. In the rare German-language video, two jihadists urged their "brothers and sisters" in Germany and Austria to commit attacks against "unbelievers" at home. Since then Germany has seen two knife assaults blamed on Islamists. In February a 15-year-old girl identified as Safia S. stabbed a policeman in the neck with a kitchen knife at Hanover train station in what prosecutors later said was an IS-inspired attack. Last September, a 41-year-old Iraqi man identified as Rafik Y. who had previously been jailed for membership of a banned Islamist group stabbed and seriously wounded a policewoman in Berlin before another officer shot him dead.